We’re counting the days to the most-awaited concert tour in the world! Are you ready for the best night of your life? 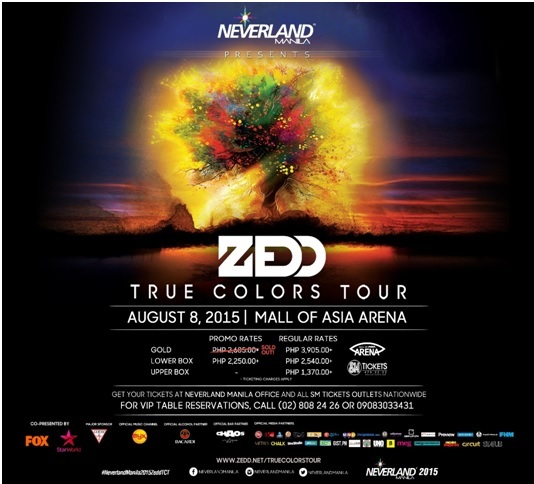 ZEDD TRUE COLORS TOUR in Manila, Philippines that is! Neverland Manila, with its commitment to provide world-class musical experience to Filipinos, is bringing in the artist that brought you dancefloor hits “Addicted To A Memory”, “Clarity”, and “Spectrum”. Grammy Award-winning DJ/producer Zedd will be performing in Manila for NEVERLAND MANILA PRESENTS: ZEDD TRUE COLORS TOUR. The “True Colors” album features Zedd’s collaboration with various artists such as Selena Gomez, Jon Bellion, Bahari, Echosmith, and X Ambassadors, among others. Zedd, Anton Zaslavski in real life, has released an album that shows off his versatility and knowledge, not only as a musician but as a producer and hitmaker. He recently released his third single, “Beautiful Now”, currently topping the electronic music charts and raking millions of views on social media sites. Dare to show your true colors as Zedd, together with Haywyre, give you one massive performance at the Mall Of Asia Arena on August 8, 2015 at NEVERLAND MANILA PRESENTS: ZEDD TRUE COLORS TOUR. Neverland Manila Presents: Zedd True Colors Tour, with special guest Haywyre, is co-presented by Fox and StarWorld. Tickets are available at the Neverland Manila office and all SM Tickets outlets nationwide. For VIP table reservations, please call (02) 808-24-26 or 0908-303-3431. Major sponsor: Guess. Official Music Channel: Myx. Official Mobile App Partner: Partyphile. Official Media Partners: 99.5 Play FM; 103.5 K-Lite; Astrovision; Astroplus; DJ Magazine; Clickthecity.com; Philippine Entertainment Portal; MNL Online; Inquirer.net; WhenInManila.com; Odyssey Music and Video; Amplify.ph; Adobo Magazine; Preview Magazine; 8list.ph; Metro Magazine; Chalk Magazine; StarStudio; Philstar.com; The Philippine Star; GIST.ph; BusinessWorld; ABS-CBN; Uno Magazine; Meg; megstreetwear.ph; Inside Showbiz; Circuit Magazine; Manila Clubbing; TheFeed.ph; and Status Magazine.